Over the past ten years, most of us have expressed disappointment with where our country is going — GDP growth rate is in steady decline, corruption is all-encompassing, inflation shows no signs of abating, law and order are a joke, crimes against women are excused by politicians — the list of complaints goes on. The media have dubbed it “India’s Lost Decade”. We’ve been a free and democratic country for almost 67 years now, but we’ve forgotten that freedom isn’t free. We all want change, but change doesn’t come just by wishing for it. This is what the democratic process is for, so that all of us can be the agents of the change we want. 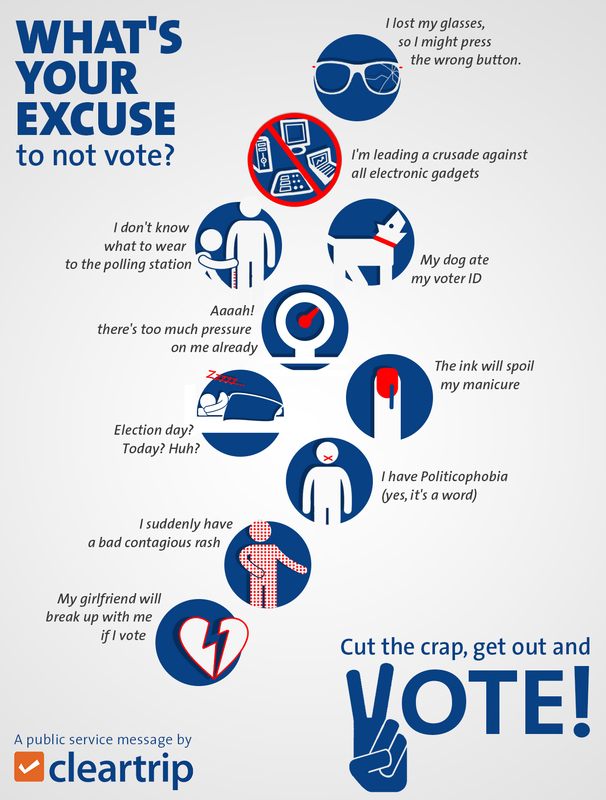 There’s lots of reasons not to vote, but if you want change, you need to make it happen yourself.